I have been accumulating a lot of miscellaneous photos over the last month in between all the close up photography I have been doing. Over the weekend I went through them and found a few gems. 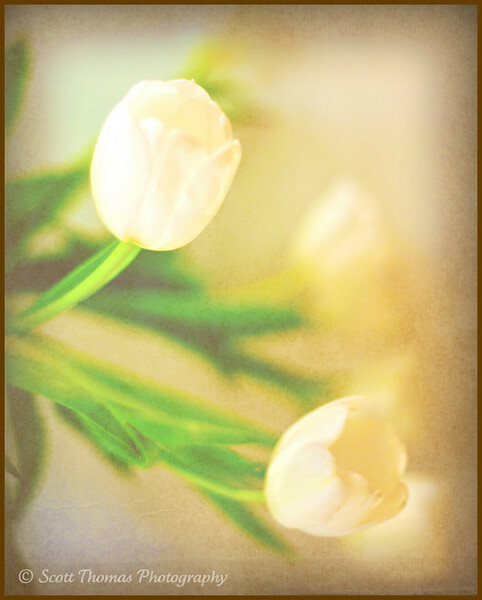 White tulips on a table. Nikon D700/50mm, 1/60s, f/8, ISO 360, EV +0.3, Texture added via Picnik.com. When I took this photo I was already thinking it would give me an opportunity to use the textures now available on Picnik.com, the online photo editor I use for special effects. St. Patrick’s Day treated upstate New York with the first and, so far, only Spring-like day this year. Not one to waste such a fine day, I went for a walk on the trail near where I work. I came upon a thistle trying to escape the fencing which keeps people away from the highway. Don't fence me in! 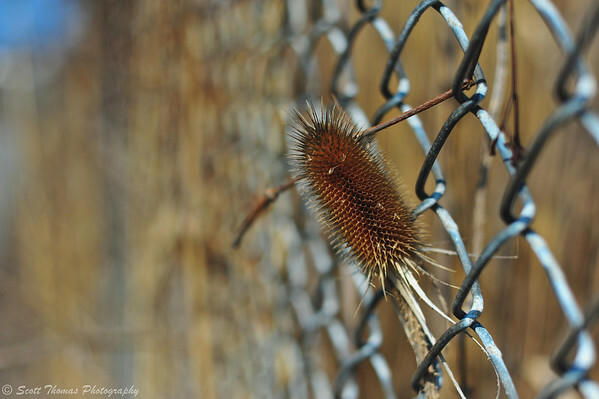 A thistle poking through a fence. Nikon D700/50mm, 1/500s, f/2.8, ISO 200, EV -0.3. The trail has a bridge which goes over the New York State Thruway. I cranked up the shutter speed to freeze this big rig just before it rumbled under me. 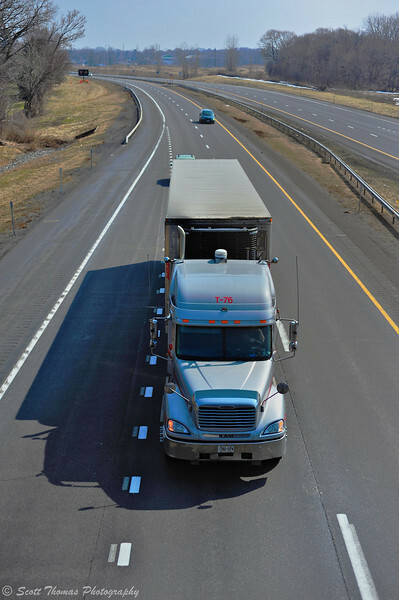 Tractor trailer rig on the New York State Thruway. Nikon D700/50mm, 1/5000s, f/2.8, ISO 200, EV -0.3. The night I photographed the Super Moon, I arrived early to find other signs of Spring at the Montezuma National Wildlife Refuge. 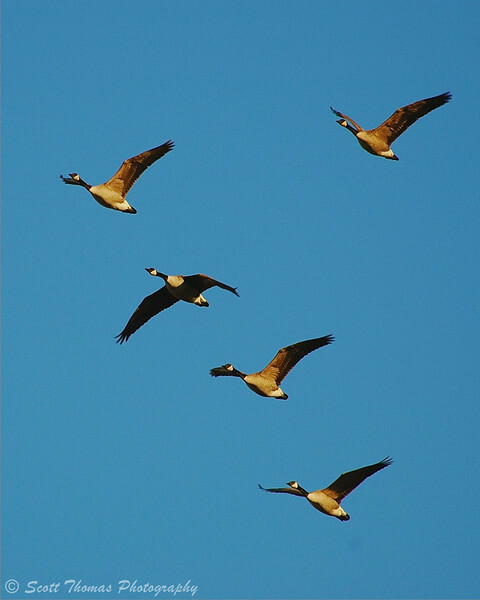 Flock of Canada geese flying over the Montezuma National Wildlife Refuge near Seneca Falls, New York. Nikon D70/80-400VR, 1/400s, f/5.6, ISO 200, EV +0.3, 400mm focal length. After landing, this goose found a peaceful place on one of the refuge’s ponds. 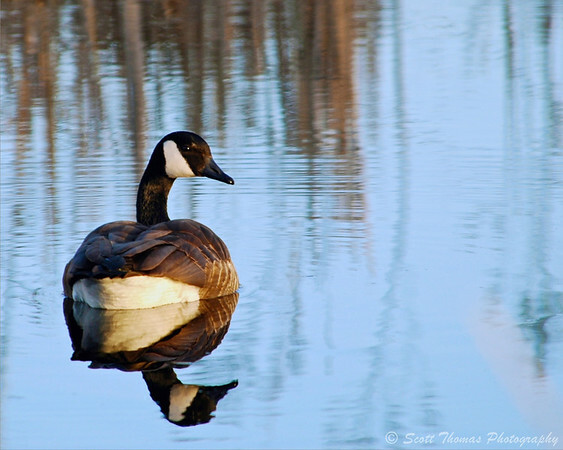 A Canada goose on a pond in the Montezuma National Wildlife Refuge near Seneca Falls, New York. Nikon D70/80-400VR, 1/160s, f/5.6, ISO 200, EV +0.3, 400mm focal length. Before moving to the location I had tracked down to photograph the moon from, I took this photo of the Earth’s other large celestial body easily seen in the sky, the Sun. 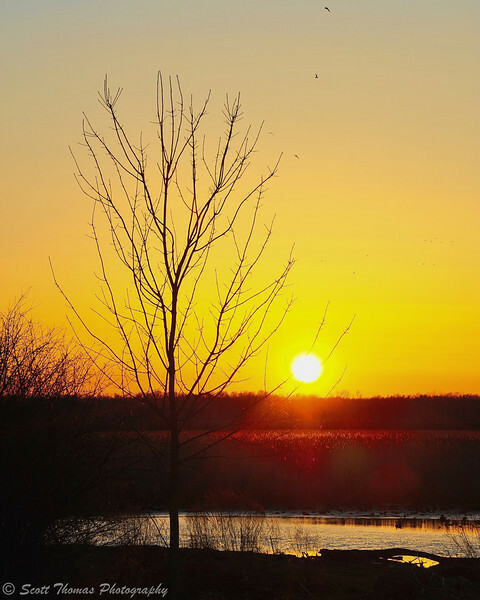 Sun setting over the Montezuma National Wildlife Refuge near Seneca Falls, New York. Nikon D700/28-300VR, 1/100s, f/22, ISO 200, EV +0.3, 122mm focal length. There, I am ready for Spring to start. Do you hear me Mother Nature? Please! This entry was posted in Nature, Weekly View and tagged 50mm, 80-400mm, big, canada, fence, flowers, flying, geese, highway, montezuma national wildlife refuge, new york, nifty fifty, nikon D70, nikon D700, picnik.com, rig, spring, sun, sunset, textures, thistle, thruway, trailer, truck, tulips, vr, water, wildlife. Bookmark the permalink. My favourite is the single goose. The colors of the out of focus reflections and the goose match the blue sky in the water. There is a ‘quiet’ mood in this image opposed to the roaring of the large vehicle. The nice thing was it was quiet. The Sun was in the golden hour and the cold temperatures kept people away. Very peaceful. It’s hard to pick a favorite, but I keeping going back to the thistle and the fence. Thanks for posting your photo data, Scott – it’s a good learning tool for me. Thank you, Barb. If you have any questions, just ask! Looks like I am not the first to say so, but I just love the color in the last shot. Gorgeous. That would be a nice location to include in your 4 seasons assignment. It could be but not the one I am using. Maybe I’ll follow it as a back up. I am ready too. Please, please, and pretty please?? These are all wonderful shots, Scott. My favorite is the flock of geese. I love the way the sunlight is hitting them. Do you subscribe to the premium version of Picnik? I’ve been considering it and wondered if you thought it was worth it. I have an ancient version of Photoshop, which works okay, but I’ve been having fun in Picnik (started doing that while traveling) and it’s so much easier than Photoshop. Magic hour light is so warm and inviting. Even on a flock of geese. Yes, I do subscribe to Picnik.com. Have since it was launched. I use it to add graphics, text and frames to some of my photos. Fast crops for the header photos here on the blog, collages and for fun edits. For only $25 a year, I find it an excellent value. I like the “thistle” best–but I think it’s teasel. Either way, it’s a great image. I like this time of year so long as I can have sun. We’ve had plenty of Sun, Gerry. But the air is very cold for this time of year. The Apple farmers say it is a good thing so I will go with that. I wish my cleaning up looked so good! I like the single goose and the thistle best. I will have to try the texture thing soon. thanks for posting the link (to Picnik). Sadly, Mother Nature doesn’t appear to be listening! I find going through accumulated shots a second (and third and fourth and…) time helps me to see them differently. I might have dismissed them as ‘unworthy’ only to go back and find a few gems. The serenity of the goose is nice….I miss watching the wildlife.